For life we need three things only: nourishment, love and peace. 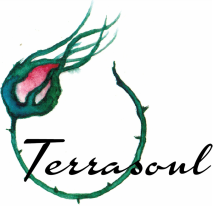 Terrasoul is like a third child to me, and her birth has been slow and laborious, but full of wonder, joy and magic. Her journey is my journey, always growing one moment at a time, tended by loving hands and bathed in endless hours of learning, witnessing and exploring. I consider myself a folk herbalist, meaning that I have decided to learn about the Earth and her plant medicine from teachers whom I admire, whenever I can, and in whatever capacity is available to me. My dream is to help restore an appreciation of herbal medicine and magic to the daily conscious, one herbal creation and ceremony at a time. It wasn't so long ago that our Ancestors belonged to the land, and so the land belonged to them. Nature was a daily part of their lives, and their livelihood and health depended so much on the weather, the crops and whatever could be foraged from the surrounding areas, which was also dependent on the season. I am intrigued by the old stories of the land, of a history steeped in traditions forgotten, misplaced and caked in a layer of dust. I delight in the surprising nature of plants to show up just when you need them, and the messages they whisper if one dares take a moment to listen. I have poured my passion and my heart into Terrasoul, and I humble myself to singing the forgotten songs of our Ancestors, and partake in the Great Song of the world. I recognize that I live and work on the unceded Indigenous land belonging to the Coast Salish peoples, including the territories of the xʷməθkwəy̓əm (Musqueam), Skwxwú7mesh (Squamish), Stó:lō and Səl̓ílwətaʔ/Selilwitulh (Tsleil-Waututh) Nations, and I have deep gratitude in my heart for this. I hope you enjoy my creations, ceremonies and healing rituals and that they bring you as much joy as they do me.